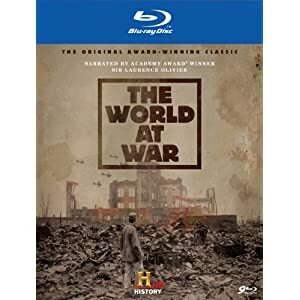 Many regard this 26-hour British TV documentary from 1973 as television’s greatest and most comprehensive account of World War II — a stirring history that features interviews with Allied and Axis leaders, civilians, officers, politicians and more. The timing of World at War’s production in 1974 allowed for a fresh look roughly three decades later. Commissioned in 1969, it took four years to produce, such was the depth of its research. The series interviewed leading members of the Allied and Axis campaigns, including eyewitness accounts by civilians, enlisted men, officers and politicians, amongst them Albert Speer, Karl Donitz, Jimmy Stewart, Bill Mauldin, Curtis LeMay, Lord Mountbatten, Alger Hiss, Toshikazu Kase, Arthur Harris, Charles Sweeney, Paul Tibbets, Traudl Junge and historian Stephen Ambrose. Certain things are quite strangely left out. The Blu-Ray comes with hours of documentaries, combat footage and bonus historical material cut from the Allies’ archives. There’s a ton of material to put the War into proper historical context, yet no one was around to record a proper commentary. However, given the talking head nature of this series…that might be a little much for most viewers. However, this release continues to stand as one of the most important television mini-series of all-time. The A/V Quality is flawless, as the 1080 transfer showcases a properly restored transfer that makes the action come to life. In the end, I’d recommend a purchase for all. *Edited to remove old plugin error* Believed fixed now.